Aside from their dashing good looks, incredible charm, and amazing rafting skills, another reason to go on a commercial rafting trip on the Kaweah is because the logistics are so much easier. All the rafting companies on the Kaweah river have access to private put-ins and take-outs, making your day much easier. 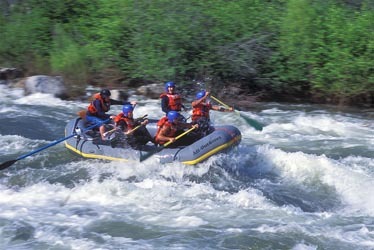 The Kaweah is a popular river for groups coming up from LA. Large groups come back year after year knowing that the water levels change constantly and it will be a different trip every time. Most companies allow 4-6 people per raft. Check with your outfitter to make sure your group will be able to ride in a boat together.